NIU board of trustees, said she doesn&#39;t know what will be done after this semester. Murer said the options include resuming classes, transforming it for some other use or closing it permanently. But it&#39;s too early to say, Murer said. "It&#39;s only been a week," she said. "Right now, the emotions are so raw that it would be premature to make a decision about what we&#39;ll do with that building." Another trustee, Barbara Giorgi Vella of Rockford, expects there won&#39;t be serious discussion of what to do with Cole until summer. At that point, she said, financial constraints have to be taken into consideration, along with the feelings of students and staff. The idea of closing the building permanently is circulating on campus but doesn&#39;t seem practical to Justin Weaver of Beloit, an NIU sophomore. 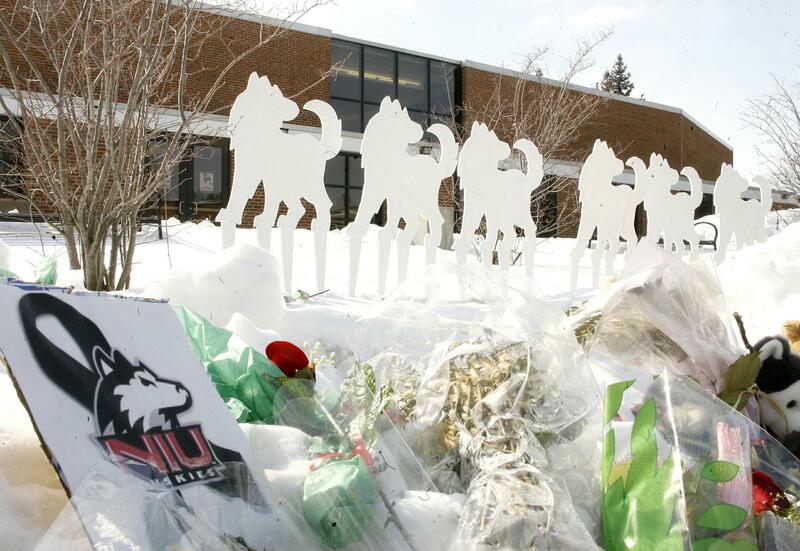 "Given that NIU already has issues in terms of space, even though it seems appropriate to close it forever given the tragic events that happened there, it still seems foolish," Weaver said. "When I looked at the schedule for reassigning classes, it was staggering how many classes are held in Cole Hall," Weaver said. "You can&#39;t duplicate that space." "The only thing that can change Cole Hall is time," he said. "As people at NIU graduate, new people will come in. They will know what happened but they weren&#39;t there and they won&#39;t feel the gravity quite as much." "Don&#39;t tear it down," said Leicht. "It&#39;s still a good building. NIU has had problems getting money from the state to rebuild other buildings. I don&#39;t think we&#39;re in a position to tear down a building." "I think a windmill is a good idea, but not as a memorial. I can imagine parents wondering what kind of memorial that is. It&#39;s not really relevant." "If we tore the building down, Harris and Klebold would have won," he said. Constructing a memorial on campus is a problem because it becomes an attraction, bringing in people not connected to the school, DeAngelis said. That&#39;s why a separate memorial was built at a nearby park, far enough from the school so students don&#39;t see people coming and going. Cho shot his first victims in a dorm room in West Ambler Johnston Hall. Two hours later, he opened fire in Norris Hall, which contains the school&#39;s Engineering Science and Mechanics program among others. Director Mark Owczarski. Approximately 10,000 of the school&#39;s 26,000 students live on campus at Virginia Tech. The school has 14 residence buildings and another under construction. "On-campus housing is a premium here," Owczarski said. "Honestly, students enjoy living in West Ambler Johnston Hall as they do in all of our residence buildings." Changing a building does only so much to relieve the hurt, said Columbine&#39;s DeAngelis, adding that he still has flashbacks. "People still ask me, &#39;what was the one day when everything got back to normal?&#39;" he said. "It&#39;s never going to come." "The first day, I would be a little anxious, knowing this is where it happened," he said about having class there. "After that, as long as that door stays locked, it would be just another classroom. It could have happened in any classroom. But I think that door (where the gunman entered) should be locked." "It would be difficult" to go back into Cole, said Weaver. But if it&#39;s reopened at some point, "it would be something I and everyone else would have to do. "I&#39;ll tell you this, though. I have had a lot of classes at Cole and I always sat in the first two or three rows. I will never do that again, not ever." "I wouldn&#39;t close it down indefinitely but definitely for the rest of the semester. Maybe open it back up next year," she said. "But let Cole Hall be for right now," she said. "Let there be a little bit of rest in Cole Hall." The library, where most of the shootings took place, was torn out and the cafeteria below it remodeled into a two-story room. A local artist painted a skyline mural with the branches of Aspen trees and 13 clouds â€” one for each of the victims. A library was built nearby. Crandon, Wis.: Six young adults were killed by a 20-year-old off-duty sheriff&#39;s deputy Oct. 7 as they relaxed in a home. Geri Nikolai, Isaac Guerrero and Sadie Gurman, “NIU has several examples to follow for Coleâ€™s future,” The April 16 Archive, accessed April 19, 2019, http://april16archive.org/items/show/1792.